You opt-in to state preservation and restoration by implementing your app delegate’s application:shouldSaveApplicationState: and application:shouldRestoreApplicationState: methods. Both methods return a Boolean value indicating whether the associated process should occur, and in most cases you simply return YES. However, you can return NO at times when restoring your app’s interface might not be appropriate. When UIKit calls your application:shouldSaveApplicationState: method, you can save data in addition to returning YES. You might save data that you intend to use during the restoration process. For example, Listing 1 shows an example that saves the app’s current version number. At restoration time, the application:shouldRestoreApplicationState: method checks the version number in the archive and prevents restoration from occurring if it does not match the expected version. If you prevent restoration from occurring, you can still configure your app’s interface manually in the application:didFinishLaunchingWithOptions: method of your app delegate. During the preservation process, UIKit calls the encodeRestorableStateWithCoder: method of each preserved view and view controller. Use this method to preserve the information that you need to return the view or view controller to its current state. UIKit calls your app delegate's application:shouldRestoreApplicationState: method to determine if restoration should proceed. UIKit calls each view controller's decodeRestorableStateWithCoder: method to restore its state information. 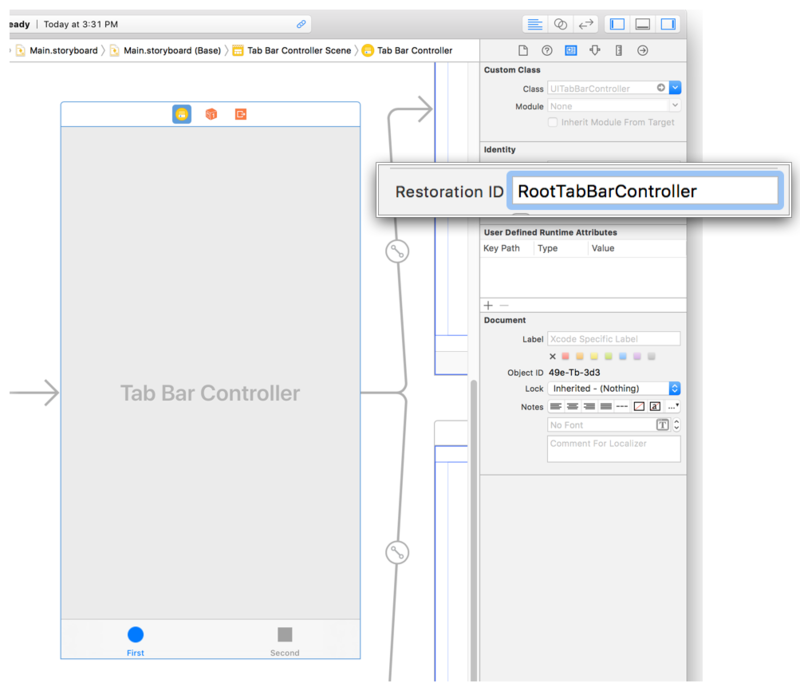 UIKit loads both the view controller and its views from your storyboard initially. After those objects have been loaded and initialized, UIKit begins restoring their state information. Use your decodeRestorableStateWithCoder: methods to return your view controller to its previous state.